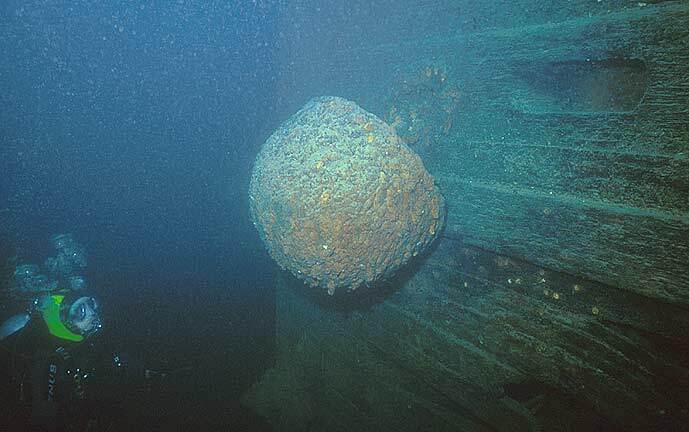 A mushroom anchor still chocked in place at the port bow. The Eber Ward was was built in Bay City Michigan by the F.W. Wheeler Shipbuilding Company in 1888. At the time of the ship’s sinking in 1909, steel ore carriers were begining to replace the old wooden steamers built for cargoes that were shifting to rail service. The Ward piled into an ice pack on the first run of the season, upbound with a load of corn from Chicago. 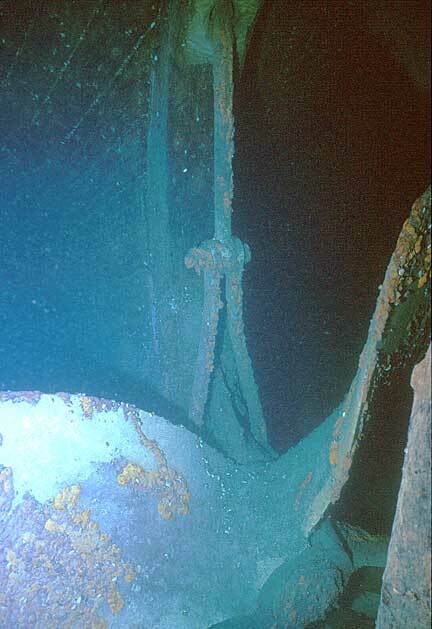 The ice stove in the front of the ship, leaving two large holes, visible today, on each side of the stem. Eight of the thirteen crew members survived the sinking. The cargo of corn was salvaged in the summer of 1909 and sold to a starch works. 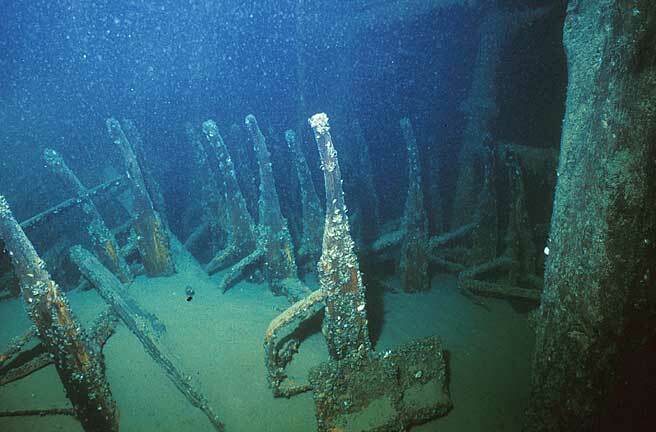 The Ward was rediscovered in 1980 by Chuck Feltner, and has become one of the more popular dive sites in the Straits of Mackinac Underwater Preserve. 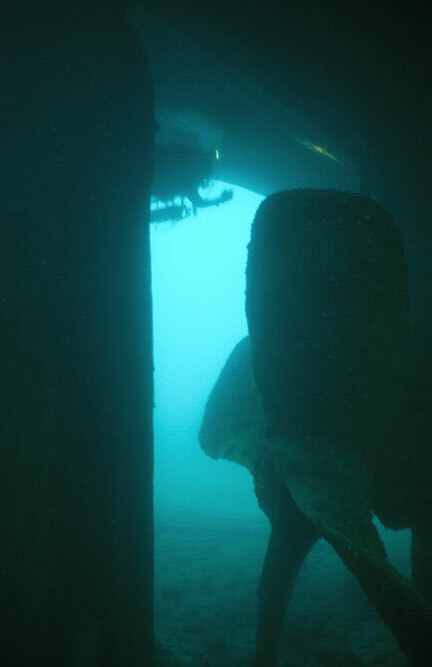 The wreck is upright and intact in 140 feet of water, about 4 miles west of the Mackinac Bridge in Lake Michigan. The Straits area can be a tricky place to dive due to currents, low visibility, and surface storms funneling up from Lake Michigan and Lake Huron. The Ward has killed several divers. Unlike the steam barges operating north in Lake Superior, the ship carried no sails. The Ward’s deck layout is unusual. Unlike most bulk carriers, hatches, instead of being large and open, are smaller and lined up along the middle of the ship. 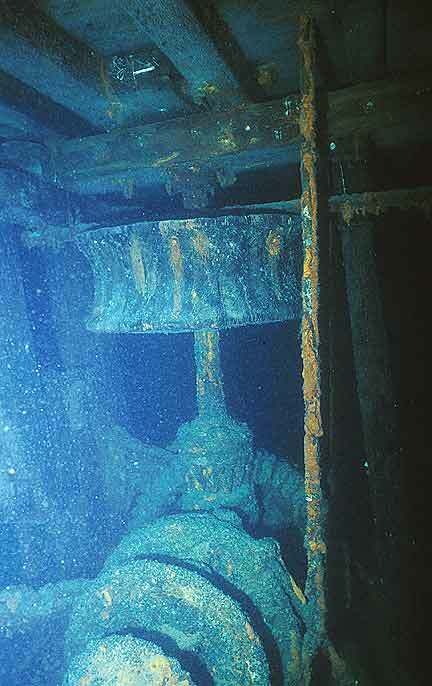 A power lay shaft runs from the engine room aft, forward to the anchor windlass machinery at the bow. This shaft running between the split cargo hatches drove a set of rollers which were used to raise and lower cargo. Small hatches between the main hatches gave crew access to both deck levels during loading operations. Lines were passed around the rollers, under a cargo skid, and tied to iron hooks bolted to the hull alongside each hatch. Packages on skids, or perhaps bins of grain could be brought in and out of the hold by the crew then freighted off to the dock, perhaps an early version of the self unloader. A mushroom anchor hangs on the port side of the bow, below two folding Navy type anchors shipped on the top deck at the bow. Much of the corn must have been loaded using numerous small wheelbarrows, now bolted to the frames on two decks in the bow area. At the stern, off the starboard side, the cook stove and a life boat lie on the bottom. A lot of dinnerware was recovered in this area back in the days before it became illegal to bring back artifacts. Under the stern the huge prop rests on the hard lake floor, an impressive sight. The ship rests on a hard bottom. 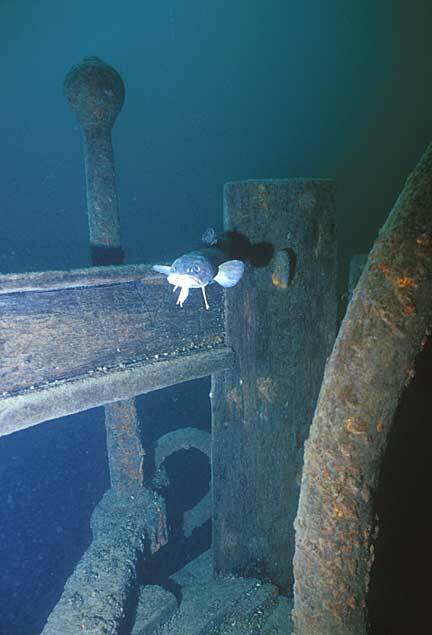 The entire propeller and most of the rudder can be seen at the stern. 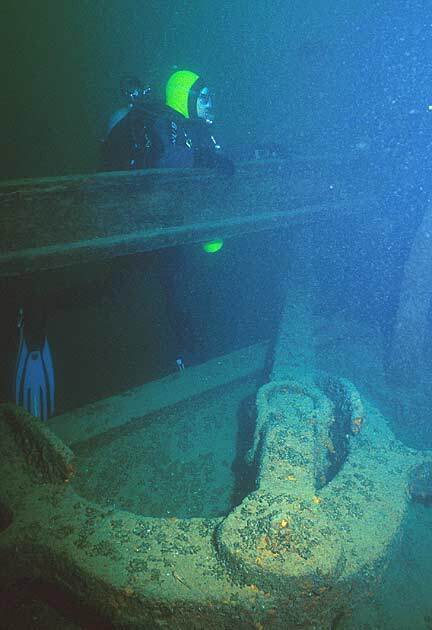 A folding Navy type anchor on the main deck, port side. Prop and shaft strut, standing on the bottom. Grain handling carts chained together around a structural beam, forward of the cargo holds. Mushroom anchor cat head and power drive to the forward capstan, one deck above.